A couple in the state of Oregon, was notified by state officials to destroy a 2-acre pond on their property. Why? It is the property's most attractive feature, and because the government said so, they have to remove it. Although, Jon and Sabrina Carey purchased the 10-acre property near Butte Falls two and a half years ago, the pond has been in place for 40 years. That fact doesn't remotely matter to the Jackson County Watermaster's Office. “I basically bought a lemon,” said Jon, who became teary-eyed at the edge of the partially ice-covered body of water being targeted by government, in an interview with the Mail Tribune. “That's how they explained it to me.” The couple desperately wants to keep the stunning longstanding feature in tact, so, as the Mail Tribune reports, the Carey's have “pleaded with the Medford Water Commission to adopt the pond, then treat it as a municipal water source. This was something that Jackson County Watermaster Larry Menteer is opposed to, due to the precedent it would set. “The Water Commission has rights to the watershed around the Careys' property, where dozens, if not hundreds, of ponds are located, as well as Medford's primary source of water, Big Butte Springs.” The Carey's aren't the only people in the watershed who had difficulties with ‘the government's’ water. Eagle Point resident Gary Harrington spent 90 days in jail for illegally harboring some 13 million gallons of rainwater — that's enough rain to fill around 20 Olympic-sized swimming pools. Wow! “The bigger story here is that rainwater collection is indeed kosher in Oregon, provided that you're capturing it from an artificial, impervious surface such as a rooftop with the assistance of rainwater barrels. An extensive reservoir set-up complete with 10- and 20-foot-tall dams is forbidden without state-issued water-right permits, as Oregon law dictates that water is a publicly owned resource — and Harrington did not possess said permits.” Harrington and the Oregon Water Resources Department waged an extended battle over the ponds, and at one point, it was ruled he would be allowed to keep everything in place. That decision was backtracked in less than one year. “Rain Man,” as he was called, was charged with nine misdemeanors, spent three months behind bars, and had to shell out $1,500 in fines — and ordered to destroy the dams and drain all of his ponds. Harrington's case might have been much more complex than the Careys' — considering the large volume of water and infrastructure he'd put in place — but they share a similar theme of overbearing government and arguably unnecessary law versus the right of people to do as they please with their property. “When you're honest, they take everything away from you,” said Sabrina Carey, who inspected country records — which plainly showed the pond — before they purchased the property. Going by the book might have been the ‘fatal’ error for the couple, however, since the county didn't take issue with the pond until Jon sought to grow legal medical cannabis on the land and had to prove there was a viable source of water for the grow operation. According to the Watermaster's Office, the previous owners had not received a permit for the pond, so the Careys were now in violation of Oregon regulations — and they would have to shoulder the cost of draining the water. 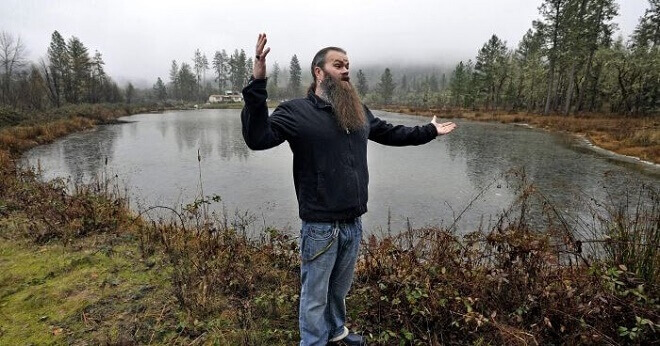 In an effort to prove the pond is legitimate and to persuade county government to allow it to remain on the property, the couple stopped using it — even though the well on their land had run dry — and began shipping in the water for daily living and gardening from nearly Butte Falls. They've also had to hire attorney Sarah Liljefelt, who filed a request with Jackson County to provide a permit for them to store water, stating, “The reservoir on Ms. Carey's property, though small, is one of the largest in the area.” As the Mail Tribune notes, “Liljefelt said the pond is an important source of water for beavers, otters, elk, deer, bear, mountain lion, bobcat, bald eagle osprey, great blue heron, snowy egret, Canada geese and the western pond turtle.” The large pool of water does more good for the environment than if it weren't there. During their legal fight with the State, the Careys even suggested it be utilized for fire control and prevention, like Harrington did, as the pond is easily accessible by fire crews. The county has displayed only nonsensical disapproval on the issue. “This pond seems to be doing way more public good than not being here. Why, now, is it so important to be removed?” Jon said. The 40-year-old man doesn't even profit from the medical cannabis grown on the land he and his wife own, as he literally gives the crop — free of charge — to friends. However, the commission failed to state why this should be a matter for the government in the first place — why punitive bureaucracy needs to meddle with a pond on private property, serving as a valuable ecosystem, that poses no threat to anyone or anything, and isn't even an eyesore, must be destroyed. Besides a trailer home and dilapidated house, the pond is the only thing of value on their acreage, and, obviously, as Sabrina said, “We didn't buy it for the double-wide.” She told the Mail Tribune the pond should have been registered with the Oregon Water Resources Department nine years ago, but the owners at the time didn't reside on the property and didn't do so. They offered to reduce the pond's size, so that it can allow officials to inspect it when necessary, and have provided a draft easement to the commission in hopes of allowing the prized water feature to remain intact. Government feels entitled to not just own only something located on private property, but that people should never be legally allowed to collect rainwater, is what's wrong with big government, and overregulation of people's rights and civil liberties.